Rarely do I become emotionally outraged by biased stories I read in the media. Frankly, I find much of it to be useless drivel. Yet, when people attack a man like Warren Buffett, it really strikes a nerve with me. I have read Roger Lowenstein's brilliant biography of Buffett, I read his annual letters, any public articles he writes and I watch every interview that he does on CNBC and other networks. I do not know Buffett personally (I wish I did!) and I may not be an total expert on him but I have a decent handle on his beliefs and actions. I could not have more respect for the man and the criticisms of him are unjustified and damaging not only to him but I would argue to the financial system as a whole. 1. His open and honest assessment of his investment mistakes in every annual letter to shareholders. He has a laudable amount of humility; his writings contain absolutely no level of arrogance. 3. His entirely unpretentious lifestyle. For a man that could afford nearly anything in terms of material wealth he lives in the small house he grew up in located in middle America's Omaha, Nebraska. 4. His salary at $100,000 a year. He makes and loses his real income every year right alongside his shareholders, whom he rightly refers to as partners. What other CEO do you see doing that besides one of my other heros in business, Steve Jobs (who actually gets paid $1 per year)? 5. His donation of 85% of his wealth to charity through the Bill & Melinda Gates Foundation. He has a strong belief that he has lived under an incredible economic system in a wonderful country that has allowed him to prosper far beyond his needs. Therefore, he believes he owes something back for being given such opportunity and he has backed up his words with action. Philanthropy on that scale should be awed and applauded. 6. His lack of excessive risk-taking as a manager. There is no agency problem at Berkshire because Buffett and long-term business partner, Charlie Munger, put their life savings into the company. They treat the business as their own and only ask of all their managers that they do the same with their individual businesses. 7. His willingness to openly share his investing wisdom in interviews and various events, especially during the annual Woodstock for Capitalists held in Omaha. He has also written well-timed articles advising Americans when to sell bubbles and when not to panic. 1. He has supported Goldman Sachs' actions throughout 2007 and thinks Lloyd Blankfein is a decent guy. I don't see why Buffett should be criticized for supporting Goldman. Most of us just started thinking about the "evil" Goldman Sachs about 2 years ago when the size of their bonuses shocked us. Buffett has worked with the investment bank for 4 decades doing a multitle of different transactions with them. A seasoned man of finance, he trusts himself in his investment decisions and does not believe a market maker should be required to disclose the counterparty to a transaction. 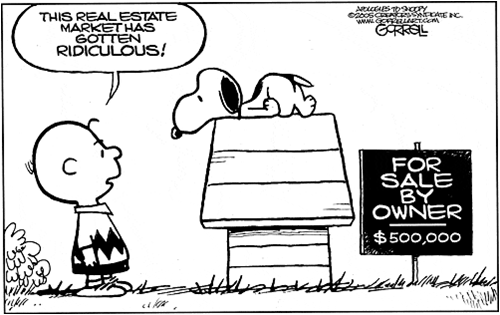 I do not see where in the law it requires a market maker to do so. Now, there is a legitimate argument to be made in Congress as to whether a market maker should be able to trade its own book. Hearings like the one recently run by Senator Levin are great and constructive to the reform process. Congress should openly debate the current structure of our system and decide what the role of a market maker should be in the financial markets. And, if the "Fabulous Fab" Fabrice Tourre materially misrepresented Paulson's involvement in the ABACUS deal, then I completely agree, censure is justified and deserved. Securities law does not allow an entity to present materially false information, that is rightly classified as outright fraud. Fines may certainly be in order should this misrepresentation be proved in court. But, this idea that Goldman was some amazing profiteer just doesn't hold water. Goldman made $500 million in 2007 on their net short position in mortgage-backed securities, less than 1% of firm revenues. I'm sorry, but you're dealing with Wall Street, and a prop desk no less. If these traders were as smart as we make them out to be, they would have made a hell of a lot more than half a billion. I believe Blankfein when he says their objective was to get close to home (flat) and a less than 1% of revenue net impact is pretty damn close to net flat in my book. I mean, seriously, they paid out $12.1 billion in employee bonuses in 2007 giving indication of how relatively small a $500 million profit in RMBS was on their books. It also seems to me that many of us are suffering from a case of hindsight bias. We look back and say, "it was obvious". Well, bubbles become bubbles precisely because they're not obvious until the end and even when the are, it's so hard to time it correctly. 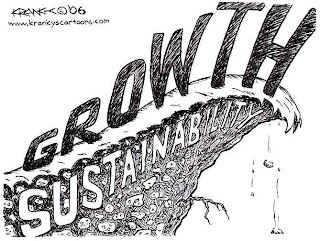 I did a presentation back in college in 2004 for my international finance class that included the cartoon below. 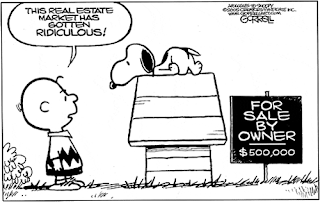 I was highlighting the bubble in real estate in 2004...it didn't pop until 2007! Even though many knew there was a bubble, the ability to time the correction was incredibly difficult. Paulson could have just as easily been too early and blew himself up. In any given bubble, there will be a select few who time it perfectly and make amazing profits. I say good for them because they risked destruction stepping in front of the runaway train and they deserve the out-sized profits that come with that level of risk. 2. Buffett is NOT a hypocrite as Lauren Tara LaCapra claims over at TheStreet.com. He is lobbying to make the financial reforms on derivatives not retroactive. Buffett previously entered into contracts with a set of agreements in place and plenty of capital to withstand adverse movements. Congress would be fundamentally altering his contracts and changing the terms. Buffett may not have entered the contract if he had to post massive collateral! Most of the criticisms come from Buffett's oft-quoted statement that derivatives are "weapons of mass destruction" and while that is true, derivatives do have a very legitimate purpose and can be used wisely in the right hands. An investment bank already levered 30-to-1 on an asset-to-equity basis building a portfolio with a notional value in the trillions of dollars is incredibly reckless and irresponsible. An extremely well-capitalized, unlevered firm effectively writing insurance policies in the midst of the greatest financial market panic in 80 years is not reckless, it's admirably prescient business. This is what Buffett did. He sold puts on the S&P 500 at panic-level prices expiring a decade out, the first expiring in 2019. Now, how was that a foolish move? Yet, because of the irresponsible users of these instruments, Congress aims to retroactively punish someone like Buffett. Contracts simply should not be changed after the fact and this is precisely Buffett's complaint. Buffett's lobbying efforts basically say "yes, change the rules going forward but do not force changes to existing contracts". This is far from hypocritical. 3. 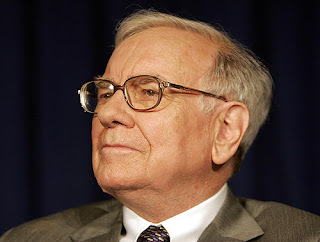 David Weidner's satirical piece of Buffett on MarketWatch this week was infuriating. Comparisons to Bernie Madoff are absolutely disgusting, even in satire. Weidner wrote as a mock of what Buffett would say at his annual shareholders meeting: "You know who else get's a bad rap? Bernie Madoff. Like I said about Goldman, I haven't seen anything in Madoff's behavior that makes him any more subject to criticism than investment managers generally. Investment management is a very defective system. When systems are defective, very good people will start doing things that are counterproductive. In this case, that means bankrupting widows, orphans and charities." Are you f#$%ing kidding me, Weidner? Madoff was a blatant fraud with absolutely no remorse who outright stole tens of billions of dollar from his clients in a couple decade-long Ponzi scheme. He destroyed lives and bankrupted people single-handidly. Buffett, on the other hand, has run an upfront investment business demonstrating the highest of ethical standards creating billions of dollars in wealth for his thousands of shareholders. The hypothetical quoting of Buffett, even in jest, is inexcusable and defamatory. Warren Buffett is an admirable man of finance that should be seen as an example of what the financial business could, and should, be. The field is filled with liars, cheats, frauds and every level of con artist imaginable. In the midst of this stands a guy of the utmost integrity and discipline looking to invest wisely and honestly to increase the financial well-being of his partners. The criticisms could not be more unwarranted.